The halfling only smiled as the beastfolk drew the axe from his back, intending to rob the little sharply dressed merchant, he counted to three for the halfling to relinquish his valuables, he didn't make it to two. Though some contend that the "Invisible" part may almost certainly be a misnomer, is it not when a threat is failed to be perceived then it is, for all intent and purposes, just as good as invisible? Probably not, but nonetheless herein lies the core of the Invisible Blade; to appear as little a threat as possible, sowing the seeds for gross underestimation and reaping the rewards with glee, savoring the frustrated look on their opponent's face. That and "Underestimated Blade" was not as stylish. The Invisible Blades began as offshoot from the equally secretive Master Throwers of Therafim, with many of the original founders being Master Dagger Throwers who took to furthering the art of fighting with their weapon of choice, relying on the same core principles of superior planning, quick reflexes and surgical precision, demonstrating that the key to success in combat is not always through big muscles, weapons or spells. Though the Invisible Blades have long since moved to allowing non-master throwers into their ranks, all initiates honor the Invisible Blades Origins by learning the dagger throwing style of the original founders, the styles playing a large role in all member's initiation rites. The Invisible Blades maintain their secrecy chiefly by misinformation; depending on who you ask, the Invisible Blades are either; a Gentleman's club in Avalon, a spellsword mercenary group from Rossland, a mysterious cult from distant Khalid, a merchant group from Bahgraihb, a vigilante group from Killian, or any of the other creative facades being put up constantly by the more creative members of group, though not all of these are untrue, In the end, only a competent master of lore can pick out the Invisible Blades true nature from the shrouds of misconceptions. That is not to say that the Blades have never come into attention, their supposed pseudo-mystical ways charming and evoking wariness alike, some literate folk have even gone so far to relate the group with various major historical events, playing up conspiracy theories about the role of the Invisible Blades in the affairs of nations. A notion that has left the blades themselves nonchalant and even somewhat amused as this notion came and went from public attention, the Invisible Blades themselves being used as antagonists and protagonists alike in various works of fiction. The truth of course is a bit more simpler; the only things always true about any group of the Invisible Blades is that they share and train in a unique fighting style and their initiation ritual. Aside from that, Invisible Blade orders, chapters or whatever denomination any particular group likes to follow are far more decentralized and diverse in nature, with such examples as one group in Cargando admixing religious tones into their activities, as most of their members are clandestine clergy of El Ahrairah And Reynard, while another one group in the City of Wilder seem to have developed to revolve around a local underground blood sport fought in the lower wards of the towering city, becoming a major faction in the competition. Many Invisible Blades even decide to avoid the underground organization model altogether, preferring to practice in solitude and picking up the occasional student to pass on their training. All these different groups must still observe the Initiation ritual for any new members, a perspective member must prove his skill with a dagger or a like-minded blade by defeating a worthy opponent through the sole use of such weapons, a special arena is prepared for such a test and is attended by local chapter leaders. Many chapters take different views on what a "worthy opponent" actually means and have consequently designed their own version of this trial, having initiates fighting everything from each other to wild animals (or in some cases, slaves) caught especially for this occasion. The other mandatory part part of the initiation is paying homage to the original founders of the Invisible Blades by demonstrating the ability to throw a dagger effectively. Again, many chapters take different approaches to this trial, but the most common is to have the initiate hit at least one target from a distance of 30 ft, further hits would result in discounts to their nominal initiation fee, while hitting them all would waive it off altogether and net the recruit an ornamental masterwork dagger, though not all chapters observe this. The typical Invisible blade was once a rogue, who chose this path because his sneak attack ability dovetailed nicely with the abilities of this prestige class. Bards and monks are also good candidates, as are barbarians, fighters, and rangers who are willing to exchange their arsenal of weapons for a less cumbersome approach. To qualify to become an invisible blade, a character must fulfill all the following criteria. Skills: Bluff 8 ranks, Sense Motive 6 ranks. 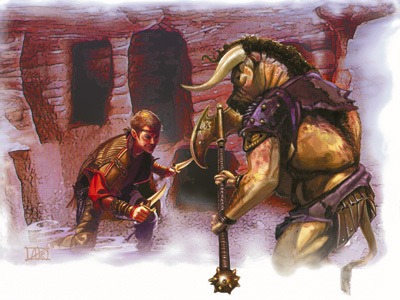 Special: The candidate must defeat a worthy opponent in single combat using one or more daggers, kukris, or punching daggers in any combination as his only weapons. The invisible blades' class skills (and the key ability for each skill) are Balance (Dex), Bluff (Cha), Climb (Str), Craft (Int), Escape Artist (Dex), Jump (Str), Hide (Dex), Listen (Wis), Move Silently (Dex), Perform (Cha), Profession (Wis), Sense Motive (Wis), Spot (Wis), and Tumble (Dex). All of the following are class features of the invisible blade prestige class. Weapon and Armor Proficiency: Invisible blades gain no proficiency with any weapon or armor. Dagger Sneak Attack (Ex): An invisible blade gains the sneak attack ability if he does not already have it, but the extra damage applies only to sneak attacks made with a dagger, kukri, or punching dagger (the DM may allow other similar weapons). When making a sneak attack with one of these weapons, he deals an extra 1d6 points of damage at 1st level, and this increases to 2d6 at 3rd level and to 3d6 at 5th level. If he already has the sneak attack ability from a previous class, the applicable bonuses on damage rolls stack. Unfettered Defense (Ex): An invisible blade benefits from an increased survival instinct during combat. Because of this sixth sense, he adds 1 point of Intelligence bonus (if any) per invisible blade class level to his Armor class in addition to any other modifiers he would normally receive. If the invisible blade is caught flat-footed or is otherwise denied his Dexterity modifier to Armor Class, he also loses this bonus. Unfettered defense functions only when an invisible blade is not wearing armor and is armed with one or more daggers, kukris, or punching daggers as his only weapons. Bleeding Wound (Ex): An invisible blade of 2nd level or higher who makes a successful dagger sneak attack can choose to deal a bleeding wound, sacrificing 1d6 points of the extra damage from the dagger sneak attack. Such an attack deals damage as normal in the round when the attack hits. Thereafter, the wound caused by the invisible blade's dagger bleeds for 1 point of damage per round. Multiple wounds from the weapon result in cumulative bleeding loss (two wounds for 2 points of damage per round, and so on). The bleeding can only be stopped by a DC 15 Heal check or the application of any cure spell or other healing spell (heal, healing circle, and so on). Creatures immune to sneak attack damage are immune to bleeding wounds as well. Uncanny Feint (Ex): At 3rd level, once per round, an invisible blade gains the ability to feint in combat (see page 57 of the Player's Handbook) as a move action rather than a standard action. At 5th level, the character can feint in combat as a free action. An invisible blade can use uncanny feint only when armed with a dagger, kukri, or punching dagger. Feint Mastery (Ex): At 4th level, an invisible blade armed with a dagger, kukri, or punching dagger becomes so sure of his ability to mislead opponents that he can take 10 on all bluff checks when feinting in combat, even if stress and distractions would normally prevent him from doing so.